Seen last Sunday, getting ready for a 29-day Grand World Voyage from Auckland to Hong Kong, via the eastern coast of NZ and Tasmania, Sydney, … . 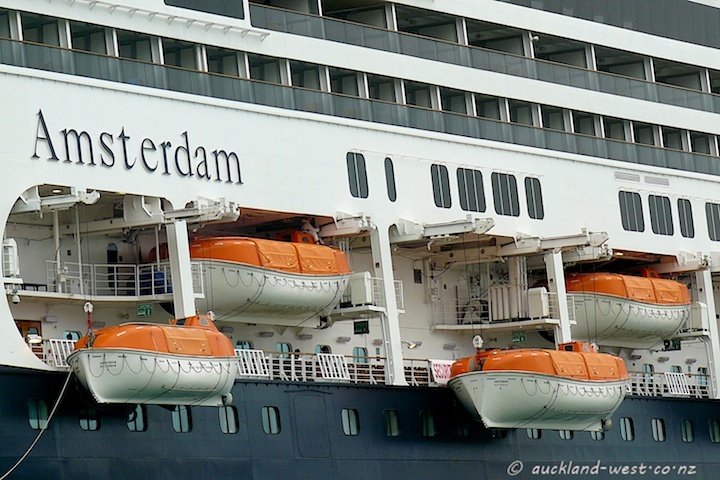 Nice orange lifeboats, best if they can stay in their alcoves for the duration of the trip. The picture was taken from the Fullers ferry to Waiheke Island, where we walked the Headlands Sculpture on the Gulf exhibition, concluding with a visit of Cable Bay Vineyards. Some pictures in future posts.